The uprisings in Ferguson (and elsewhere in the U.S.) have already inspired lots of songs, and now N.A.S.A. 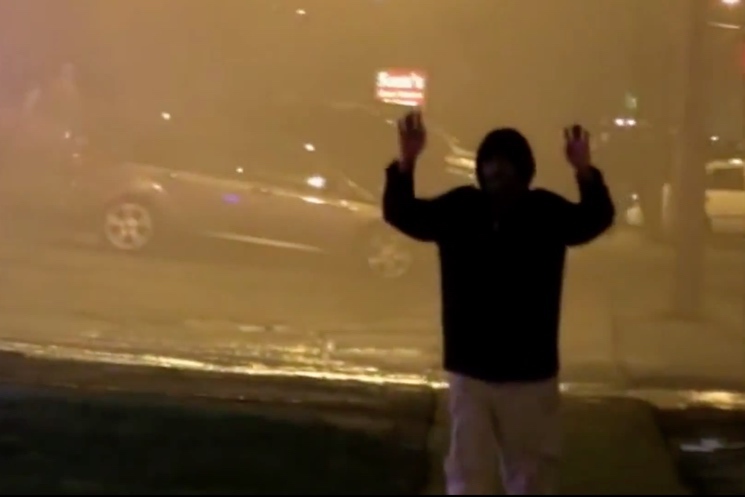 have become the latest to offer commentary on the situation with the politically charged track "Hands Up, Don't Shoot!" The electronic, dancehall-tinged hip-hop cut takes its title from the shooting of Missouri''s Michael Brown, who allegedly put his hands up before being shot by officer Darren Wilson last year. The song features Sean Paul and Lizzo, while the accompanying video is a disturbing collage of protest footage and clips of police brutality. After seeing all of this craziness going down with police brutality over the last year, i felt like i had to do a song about it. I know it's a complex problem. Policemen have one of the hardest jobs in the world, but there is a real endemic issue here around abuse of power and lack of consequence for wrongdoing. One positive thing that's come out of all of this, and something that's inspired me quite a bit, has been seeing young people rise up and let their voices be heard. As a child of a generation that was largely apathetic, it's been beautiful seeing people feeling empowered, speaking out, and trying to bring about change. As a culture of young people around the globe, i feel like we are more mobilized and politically empowered than i ever remember.